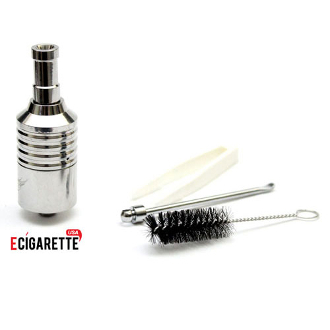 NOTE: This atomizer comes with a packing tool, cleaning brush and tweezers to aid in maintenance and cleaning. 1. Unscrew the atomizer at the middle. This will reveal the bowl coil head. 3. Reconnect the two pieces of the atomizer by screwing them back together. 4. Connect to your favorite eGo battery and enjoy your vaping experience.